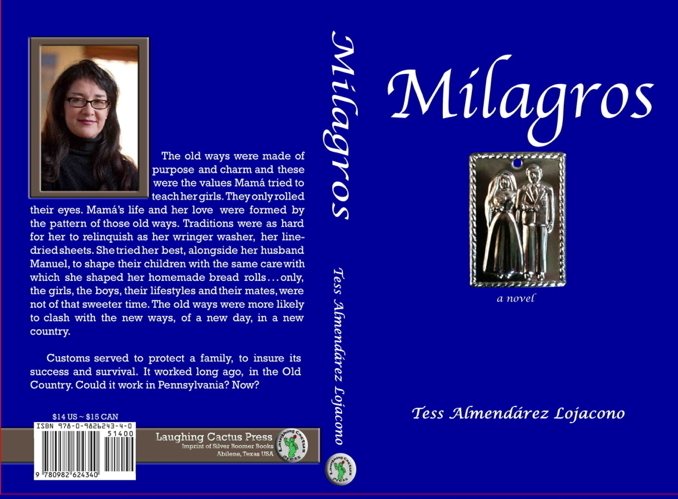 Buy your copy of Milagros for $14.00. Claudio stood in the doorway watching his daughter, oblivious now to the worn, bunched carpet, low windows, paint peeling from their sills, the chipped bureau his wife had rescued from someone else’s garbage. Mercedes was kneeling by her bed, intent upon a project. She didn’t turn. “Drawing,” came the grave reply. He moved closer and looked over her shoulder. A piece of cardboard was balanced on the bed’s flowered comforter. She was using markers. Her mother didn’t allow markers upstairs, in the bedroom, but he wouldn’ t say anything. The cardboard was divided into three parts. Mercedes stopped for a moment, tilted her head. “I’m studying on heaven – on getting to heaven.” She resumed drawing. They were quiet for a while. Claudio studied the cardboard. In the first section was a picture of blue bird eggs, resting in their nest, a baby bottle like the one Mercedes had clung to for years, a pink blanket and what looked like a drawing of a mother holding a little girl; Mercedes and her mom, no doubt. In the middle section was a picture of a foal, cut from a magazine, a pizza, a purple house, and the photo of Mercedes’ mother she kept in her backpack to look at when she was feeling sad at school. The last section showed a prayer book and a rosary draped over a golden chalice and a cross, surrounded by a field of orange flowers. Mercedes finished coloring in a crown, just above the cross. She sat back on her heels. “It’s a great chart.” Her father’s eyes filled. “I don’t know if it’s even what we think it is. You remember what your mother always said, ‘God knows best.’” Mercedes nodded. He gathered her onto his lap. She was taller than he realized. Her feet almost touched the floor. Claudio leaned over her and lifted the photo of his wife. He kissed it once and laid it in the section that was heaven.